Citation Information: J Clin Invest. 2013;123(9):3678-3684. https://doi.org/10.1172/JCI69600. 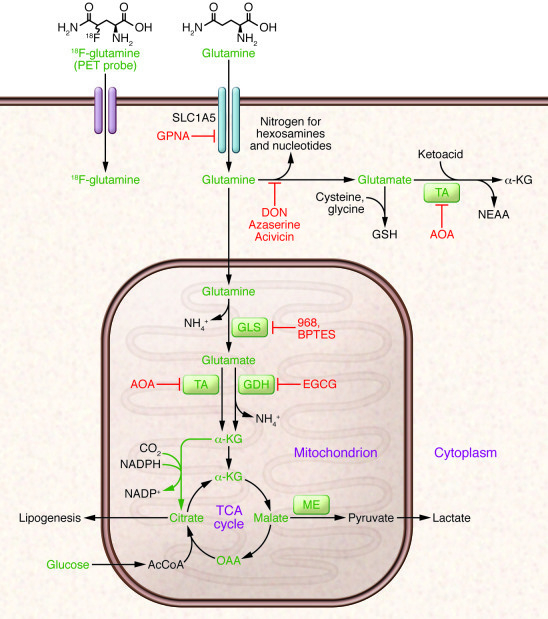 Glutamine metabolism as a target for diagnostic imaging and therapy in cancer. Glutamine is imported via SLC1A5 and other transporters, then enters a complex metabolic network by which its carbon and nitrogen are supplied to pathways that promote cell survival and growth. Enzymes discussed in the text are shown in green, and inhibitors that target various aspects of glutamine metabolism are shown in red. Green arrows denote reductive carboxylation. 18F-labeled analogs of glutamine are also under development as PET probes for localization of tumor tissue. AcCoA, acetyl-CoA; DON, 6-diazo-5-oxo-L-norleucine; GSH, glutathione; NEAA, nonessential amino acids; ME, malic enzyme; OAA, oxaloacetate; TA, transaminase; 968, compound 968; α-KG, α-ketoglutarate.